Racing Bypass Valve Type H34 vents excess pressure back into the car’s air intake making the valve ideal for Mass Air Flow (MAF) metered cars where venting to atmosphere can create a “rich” air/fuel ratio right after the valve goes off. The Racing Bypass Valve Type H is CNC machined out of billet aluminum and brass. 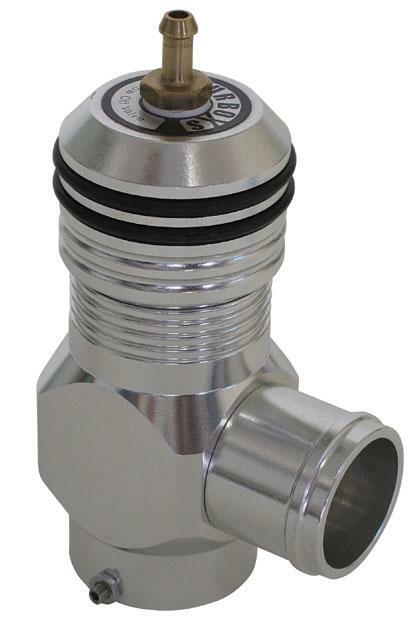 Valve operation, while louder than most stock valves, is quiet compared to a BOV that is vented to atmosphere like our Type H or Type H-RFL BOV. The Racing Bypass Valve Type H34 comes standard with a 34mm OD anodised aluminum hose adapter for the inlet.